Why do I need a home security camera system? There are far more cases where having a camera allows you to prove a claim in your day to day life. For instance, if a delivery person drops a package and breaks the items inside. Or if you are a victim of a burglary, having video evidence of the act can help move the process move quickly when filing police reports or insurance claims. Plus, with all of the new smart home appliances coming to market, integrating a home security camera can add to the feel that you’re living in the future. There’s nothing quite like having Alexa show you who is at the door when a stranger comes knocking. On the lighter side of things, sometimes having a home security system will capture fun or excite moments that you wouldn’t otherwise get to see. We can honestly say this is the closest view we’ve ever had of a woodpecker! There are many reasons why Arlo by Netgear is the number one on our list. What makes this home security system different from the others is the fact that it is affordable and it has a host of advanced features you would normally expect to see on a mains-powered IP camera. Unlike many other security cameras that are supposed to be wireless, but they turn out not to be, Arlo is 100% wire-free. This means that you can place it absolutely anywhere without worrying about cords or wiring. Arlo allows its users to see the captured footage in brilliant detail. This home security camera is equipped with eight infrared LEDs so it can also record in the dark, up to a distance of 4.5 m. When the nighttime comes, the integrated infrared lights will automatically turn on and capture even the smallest wonders. In addition, each camera has passive infrared sensors which allow it to capture motion-triggered footage while using very little power. Whenever the camera detects some unusual motion, it will automatically send push notifications and emails to its user. Arlo home security cameras are completely weatherproof and they can withstand all types of weather, hot or cold. Netgear also made sure that their users don’t have to pay for unnecessary cloud storage. Every user gets to keep (for free!) up to seven days of motion-triggered recordings. In addition, the users can choose to record the video clips to the cloud or to stream live footage directly to their tablet, smartphone or laptop. Since Arlo is a completely wire-free camera, it means that it is powered by batteries. Some users might consider this a killer feature, whereas others can find it to be quite bothersome. One amazing thing about battery-powered cameras is that you can place them anywhere you like because you don’t have to drill any holes for cables or make sure that there is a mains socket nearby. This also allows you to move the cameras around whenever you like – one day you can put the camera on a shelf to monitor your baby, and the other you may move it to the kitchen to keep an eye on your cat. 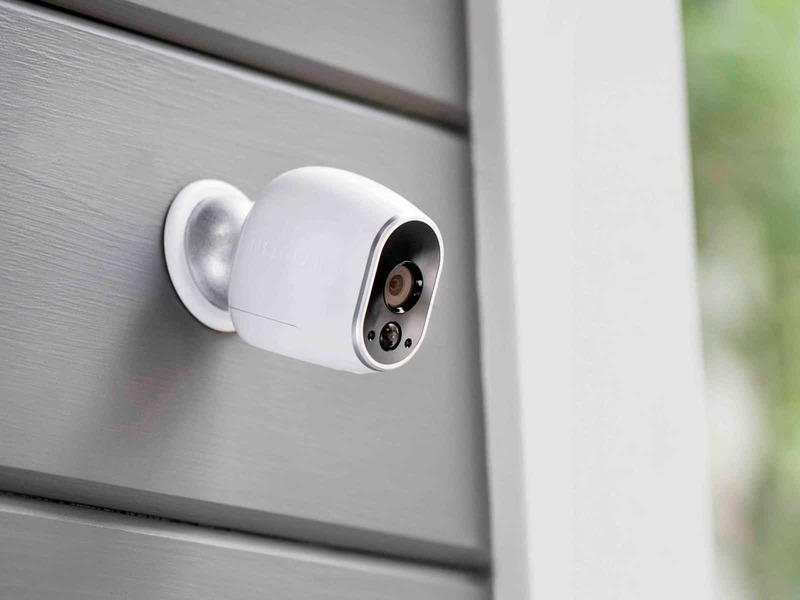 In addition, since Arlo security cameras are weatherproofed you can also point them at your front door to keep tabs on the events happening in your garden. But, no matter how amazing this sounds, there is one downside – you will have to recharge or replace the batteries regularly. One camera takes four CR123 batteries and they can last up to six months, depending on how often the camera is triggered. For example, if the motion detection is on 24/7, it is very likely that the batteries will run out sooner. But, if you set the camera to record videos at set times of the day (for example only when you’re at work), your batteries will last much longer. Regardless of how long your batteries last, you will have to replace them every now and then, and Netgear made sure to design additional accessories that will make the battery swap easy. The software used to access Arlo security cameras is pretty good. There are plenty of features you can adjust to your liking and the UI is very easy to get to grips with. 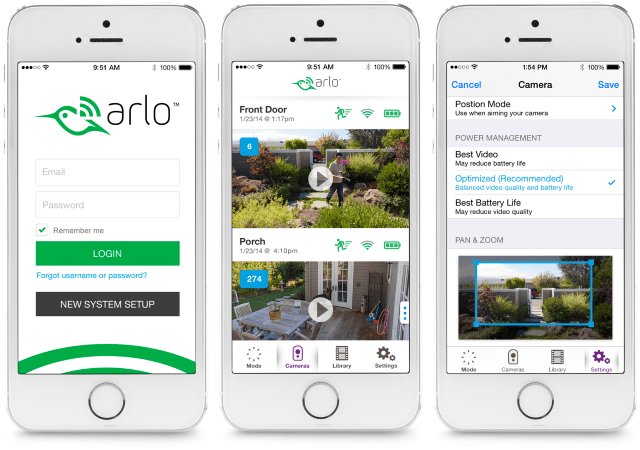 You can access settings, clips, and live video via Android or iOS apps or use the Arlo web portal. Both the apps and the web portal have the same interface. The thumbnails of your cameras will be displayed on the home screen and the clip library is located on the tabs beneath. As already mentioned, Netgear created a free, 7-day cloud storage and it allows you to sync up to five cameras. If you need more storage, you can pay additional a monthly fee of $10 for a 30-day option or a fee of $15 per month for a 60-day option. The latter option allows you to sync as many as 15 cameras. The live-streaming interface comes with play and pause buttons, which were probably included to prolong the battery life. You can watch several live streams at once or watch only one camera on a full-screen view. In addition, you can record, take a photo, or adjust the brightness within the live stream mode. In the library section, you will find a calendar which allows you to select a certain day and get access to saved clips. There are also the mode and settings sections which you can use to customize your cameras. Settings allow you to manage your cloud storage, video quality, and notifications. The mode section allows you to create schedules for the motion sensors or simply turn them on or off. The mobile apps and the web portal for Arlo home security cameras have almost identical controls aka Modes. There are three default Modes – Armed, Disarmed, and Scheduled. The Schedule Mode allows you to set time periods for each day during which your camera will be armed and then repeat them on specific days. On the other hand, the Armed Mode provides the user a nice depth of control. For example, the user can define the sensitivity levels of the motion detection and/or audio, as well as the brightness of the recorded footage. However, one thing that the Arlo home security system lacks is zoned motion detection. Arlo cameras detect motion using infrared, meaning that you can’t set the camera only to detect movement in a certain area of the frame. This makes the camera sometimes less convenient. For example, if you point it at your front garden path and the camera captures the road as well, it is very likely to be triggered whenever a car drives past. Many styles of camera covers to protect your camera or help them blend into their surroundings. 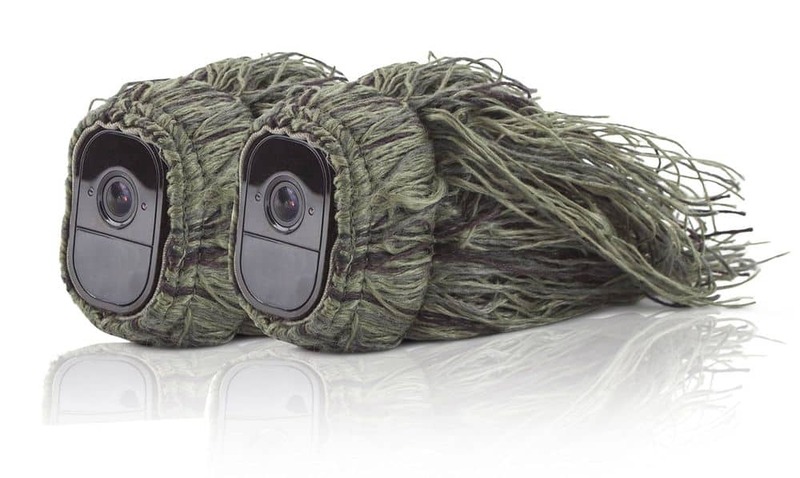 We love this Ghillie Skin for the Arlo camera, it’s perfect for hiding your Arlo outdoors. Arlo home security cameras are compatible with the rest of smart systems that can be found in your home. You can connect your camera to Amazon Alexa, Smart Things, Google Home Integration, and even use IFTTT to customize your home security system to do certain tasks. You can use Alexa to view the live feed or recorded clips from the camera on the screen of the Amazon Echo Show. You can use voice commands and ask Alexa to show the front door, the driveway, or any room where an Arlo camera is placed. In addition, you can tell your Google assistant to arm/disarm your Arlo, or to notify you by an email or even a phone call whenever your security camera detects motion. With all these possibilities, there will be almost no need for you to use the Arlo app or your smartphone whenever you wish to see what is going on in your home. 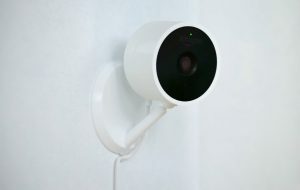 One thing that might bother some users is that Arlo security cameras capture video only for a fixed length of time or until a certain activity is over. Arlo camera can record up to 300 seconds of footage. In addition, all recordings include the 3 seconds timeframe before an event-triggered recording. This feature is quite useful because it allows users to determine what caused the trigger. Captures footage for a fixed length of time. The Zmodo Outdoor Camera System is the perfect choice for those who are on a budget, but they still need a decent home security system. Zmodo security cameras can be used both indoors and outdoors. They feature great video and image quality, powerful night vision, and motion alerts. Unfortunately, this security system isn’t perfect. Zmodo cameras don’t have audio, they don’t provide cloud recording, and motion events are not recorded automatically. But, considering their incredibly affordable price, these few flaws are certainly something you can overlook. What many users love about Zmodo Outdoor Camera System is its rugged design. The cameras are pretty tough and solid, they are designed to withstand all weather conditions. Cameras are waterproof and dustproof and have an IP65 rating (which means they are “dust tight” and protected against water projected from a nozzle). The manufacturer claims that the cameras will work in rainy and snowy conditions. However, you should keep in mind that the camera requires power from an outlet. So, be careful when choosing a location for your Zmodo cameras. When it comes to the setup of this home security system, the cameras are very easy to install. All you need to do is turn on the camera and one click will complete its network configuration. Some users have experienced some Wi-Fi issues during the setup process, but it seems to be based on their personal network. In order to install your camera easily and properly, you will need a 2.4 GHz Wi-Fi connection. Latest security cameras come with a range of advanced feature. But, the more features a camera has, the more expensive it is. On the other hand, Zmodo outdoor security camera has only one, but a worthy advanced feature: motion detection. And unlike the Arlo, these Zmodo cameras have motion zones – the ability to create virtual zones around areas you would like to monitor. Whenever the camera detects certain motion inside the motion zone, you will be notified. Motion zones are quite useful if you are monitoring outdoor spaces since there are many potential unwanted triggers. Once a motion is detected, Zmodo will notify its user by sending an alert to the user’s smartphone, accompanied by five images of the event. Since Zmodo still doesn’t have cloud storage, video of the event won’t be recorded. However, you can trigger the recording manually via the accompanying app. The captured video will be stored on your smartphone. 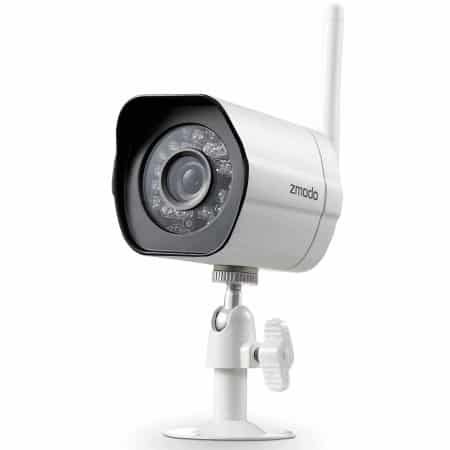 When it comes to the image quality of the Zmodo outdoor home security system, the users are impressed with it considering the camera’s price. Zmodo cameras capture images and videos in 720p HD. However, the viewing angle is a bit narrow; only 81 degrees. In addition, the manufacturer claims that the cameras can record up to 80 feet away by using the night vision which is backed by automatic infrared LEDs. The night vision feature is adjustable. For example, if the camera is placed somewhere where the lighting conditions are not stable, the sensitivity of LEDs can be lowered to improve the performance. When it comes to audio quality, Zmodo security cameras lack sound detection and two-way voice audio, even though they are equipped with a microphone and speakers. Motion alerts are delivered with 5 captured images. The Ring Spotlight Home Security Camera is a well-built surveillance camera that can withstand all the outside elements and scare off any intruders thanks to its amazing features. 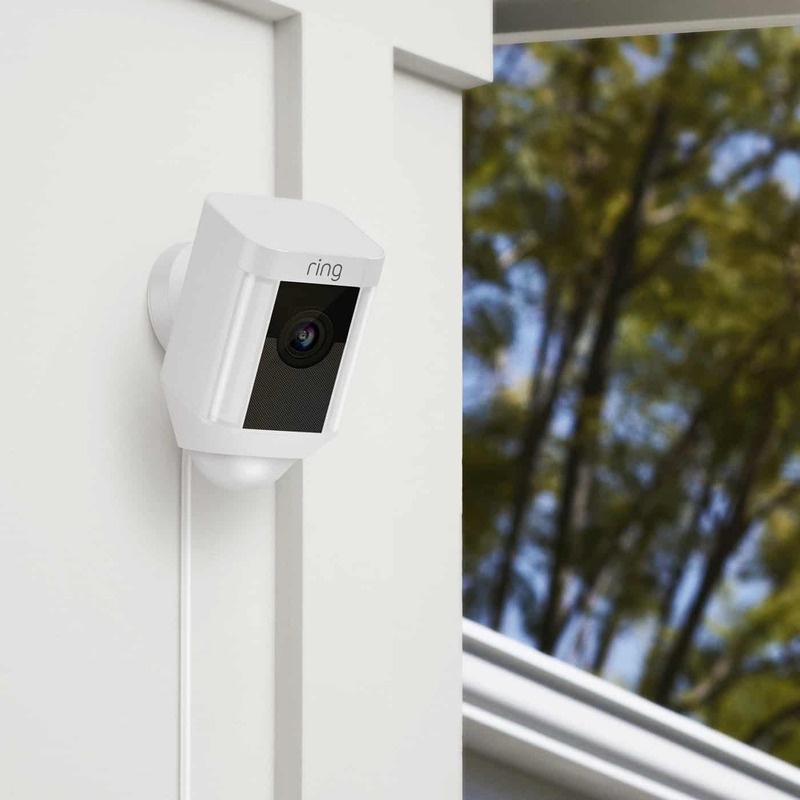 Ring Cam is a high-definition, 1080p security camera that includes features such as motion detector, bright LED spotlights, and a 110-decibel siren. In order for all these features to work, a constant wired power connection is required. Talking about power, when you receive your Ring Spotlight Cam, it will already be connected to its power cable which is 20 feet long. Luckily, the cable can be unhooked during the installation. If you are aren’t very handy and worry about installing anything new in your home, Ring has you covered. The package also includes quite a comprehensive product manual and a full installation kit – with a screwdriver, screws, cable clips, and everything else you might need to get your camera working. In addition, this camera comes in white or black and it is quite sturdy. It has an IPX5 rating meaning that it can withstand rain and even dousing from a hose. The ease of setting up this home security camera is another thing which users love about it. As soon as you hook up your camera, you are ready to set it up by using the Ring app. Basically, the app will do all the work for you – it will lead you through the basics and then get on with the configuration. Throughout the configuration, you will be guided by a step-by-step tutorial accompanied by video clips. In addition, the camera itself will provide supporting commentary making your life incredibly easy. For example, the camera will let you know when it’s connected to a Wi-Fi network, when you need to update it, and so on. Ring Spotlight Cam is packed with all the features you need to keep your home safe. First of all, 1080p and a 140-degree field of view will definitely allow you to keep an eye even on a large garden or a driveway. As soon as you get your camera up and running, you can start using the Ring app which allows you to view recorded clips or a live feed and use the camera’s integrated speaker and microphone. The Ring app comes with some manual controls. For example, you can control camera light or activate the 110-decibel alarm which will not only scary any would-be intruder but also wake all your neighbors up. In addition, you can use the LED spotlights to illuminate your garden or driveway whenever necessary. When it comes to the camera’s motion settings, with the Ring Spotlight Cam, you can create several motion zones and adjust the sensitivity for each of them. In addition, you can keep the motion alerts activated all the time or based on a certain schedule. We believe this is one of the best outdoor security cameras on the market. But there are two things keeping it from the top spot. First, the Ring camera doesn’t work as part of a system. As a standalone camera it’s great, but it’s not the best solution for those who need coverage over large outdoor areas or are trying to monitor many different spots. Second, it’s expensive relative to the Arlo model, and it’s far more expensive that the Zmodo outdoor camera that took the top spot. Has integrated motion detection, siren, and spotlight. A monthly subscription is required for video recording. So many home security cameras come with similar features that it is almost impossible to decide which one is the proper choice for your home. 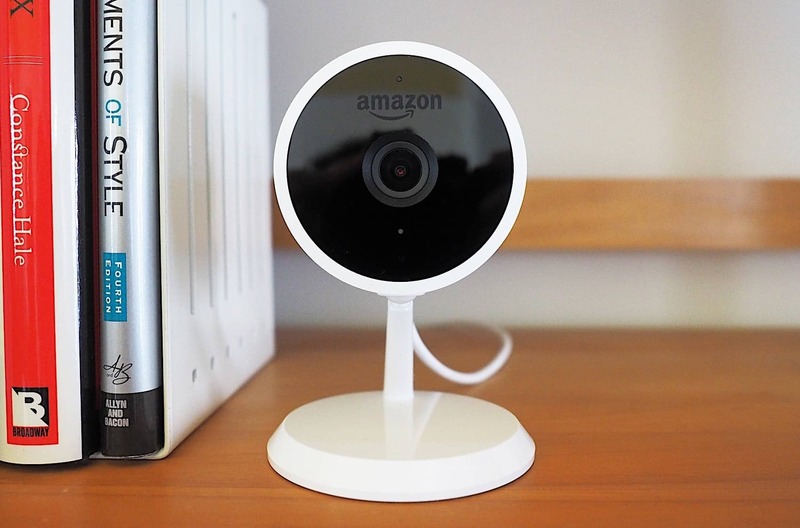 And, just like all its competitors, the Amazon Cloud Camera comes with some common features – motion detection, two-way audio, and night vision. Similarly to other brands, this camera will keep tabs on your home when you’re away. One advantage the Amazon Cloud Camera has is its deep integration into the entire Amazon ecosystem. This includes Alexa and Amazon’s Key systems. 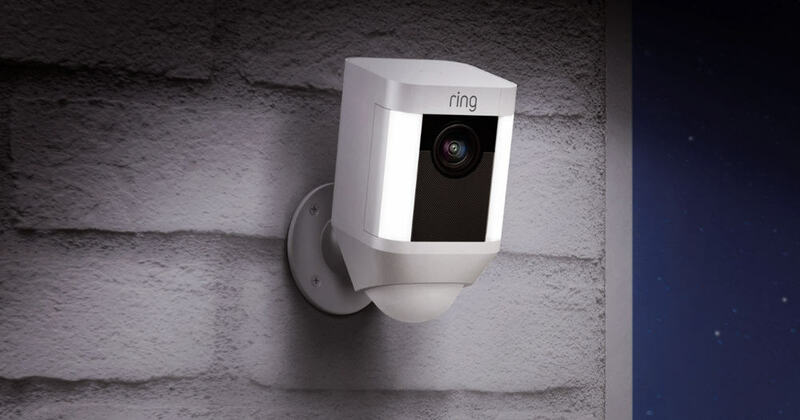 And with Amazon’s purchase of Ring, this camera will become compatible with their products such as the Ring doorbell. Cloud cam is compatible with the Amazon Key service. Amazon Key was designed to allow authorized people (such as your friends, family, and Amazon delivery people) come inside your home when you’re not there. In order for this service to work, you need to have a smart lock compatible with Amazon Key and download their app as well. The Key app will let these people in, and the Amazon Cloud cam will start recording and help confirm your deliveries or identify friends or family. Of course, Amazon made this feature completely optional, and the response from customers has been mixed. But for those that have issues with neighbors stealing packages, this could be a valuable feature. When it comes to the video quality, Amazon Cloud Cam can deliver pristine video – if the conditions are good enough. As soon as the lighting worse than ideal, the resolution will drop and certain scenes will become blurry (e.g. people moving quickly across the room). However, night vision is capable of delivering crisp results in total darkness, with faces clearly distinguishable. Since this camera has a two-way audio feature, it will not only record audio but also allow you to speak to people on-camera by using the app. The microphone is quite sensitive and will deliver clear audio even for quiet conversations. Unfortunately, its speaker is much less advanced but definitely interesting to use. Cloud Cam can store up to 24 hours of footage. Of course, if you would like more storage and some additional features, you will need to pay a monthly fee. The Basic ($7), Extended ($10), and Pro ($20) increase your storage to 7, 14, and 30 days. These will also unlock some advanced features such as the person detection which removes unwanted alerts from pets for example. But, Amazon isn’t the only one to charge these services. Others, such as Nest, charge $10 a month for the most basic option. Compared to their competitors, Amazon is definitely one of the most affordable picks. Requires monthly subscription for footage storage and some advanced features. If you are looking for an affordable camera with a good resolution and almost all of the features that other advanced home security cameras have, then this Zmodo camera is the right choice for you. 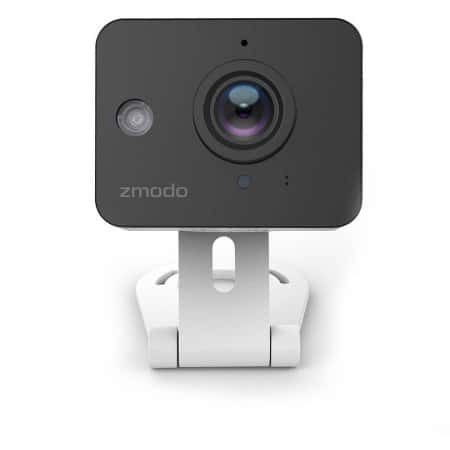 It is very similar to the Zmodo outdoor camera – it is very easy to install, it will send motion alerts and notifications to your phone, and it will record full HD 720p images. What the Zmodo outdoor cam doesn’t have and this one does is the two-way audio feature. This compact Zmodo camera has a built-in microphone and a speaker which allow a two-way communication. You can use the app to record a voice message on your phone and then send it to this camera. The message will be heard by anyone who is near the camera. That person can use the camera microphone to speak to you and you will hear what they are saying on your phone. This feature is quite useful for talking to your kids, calming your pets down, or giving your babysitter last-minute instructions. Zmodo wireless two-way audio camera also has a very good image quality. Despite its tiny size, this camera has a 115-degree field of view, meaning that you can capture an entire room without tilting the camera. It can record up to 16ft away, even in the dark thanks to the automatic infrared night vision. However, this camera comes with one minor drawback – it doesn’t record any videos. Instead, it takes snapshots at the rate of 2 to 3 frames per second. Even though this is enough to get a good idea of what is going on in your home, some users are still dissatisfied with this drawback. All images that are captured by this Zmodo camera are automatically sent and stored to the cloud. 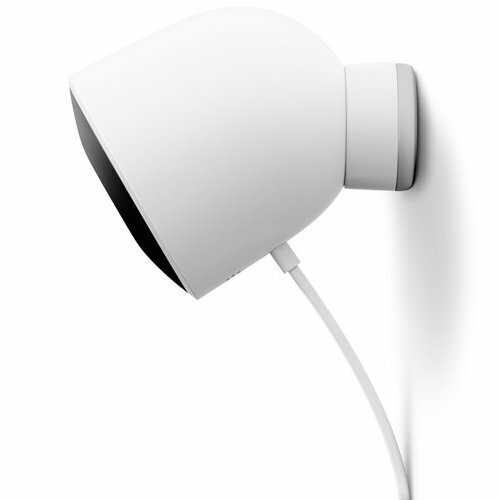 Zmodo two-way audio camera allows you to see what is going on in your home regardless of your location. All you need to do is make sure that the camera has a stable Wi-Fi connection. You can download the Zmodo app and retrieve the captured pictures whenever you choose. In addition, just like many other home security camera systems, this one will send you an alert whenever it detects motion in a room. This makes the camera an excellent security device as well as a baby (or even pet) monitor. Great cameras for the price. Has a two-way audio feature. Doesn’t record video; only takes snapshots. The camera doesn’t have battery backup; it will work as long as there aren’t any power outages. 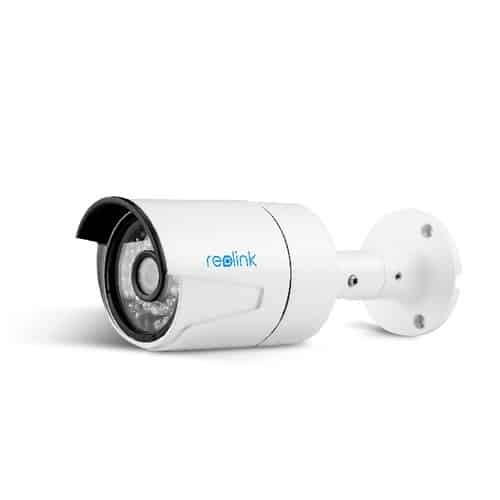 If you need to monitor a tremendous amount of space, REOLink has got you covered. Their security system includes 16 cameras for 24/7 monitoring with or without a Wi-Fi connection. This means that you will be able to cover absolutely every entrance and every corner of your home. In addition, the cameras can be used both indoor and outdoor, they are waterproof, and also have the night vision feature. If you need multiple cameras, a 16 channel security system is the optimal choice. Even though you can find 32 or 64 channel security camera systems, these are not as reliable as this one. The main reason is that so many cameras cannot work at the same time without creating network issues or interference. Even though REOLink is the budget option for a 16-channel home security system, its recording quality is quite impressive. The cameras provide 4MP super HD recording and they can even be upgraded to 5MP. Of course, all 16 cameras can record footage at the same time. However, you should keep in mind that the hardware cannot playback more than 4 channels simultaneously. Installing 16 security cameras might seem like a dreadful task, but, believe it or not, it is quite easy. There are only two steps you need to complete – power the NVR and place the cameras and run the wires back to the NVR. Once you do this, you should connect the NVR with a monitor and follow the installation wizard to choose the desired NVR settings. The wizard will allow you to configure alarms, motion detection, recording mode, and much more. Also, don’t forget to download the REOLink App and connect your smartphone to the REOLink security system simply by scanning the QR code. 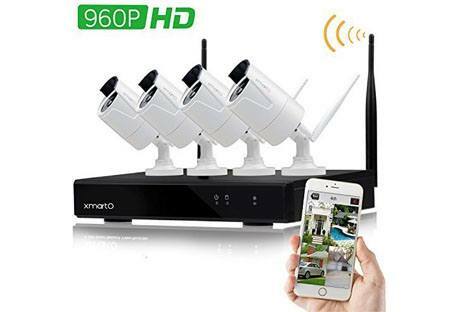 This will allow you to stream video to your smartphone and access your security system anywhere, anytime. Night vision capability thanks to infrared LEDs. Doesn’t include advanced motion detection features. Can playback only 4 channels simultaneously. Remote control option isn’t included. Every time you are not a home, it is quite normal to feel worried about your kids, pets and your valuables. The feeling of not knowing what is going on at your home can make you very anxious. What is your dog doing all alone inside your home? What if your child suddenly takes his very first step and you’re not there? Is everything at home safe and sound? Or, the worst case scenario – are there any unwanted visitors who might try to steal your belongings? Good news is, with Nest Cam Indoor Security Camera, you can always see what is going on inside your home while you’re not there. One of the best things about this Nest Cam is that it is very easy to set up. All you need to do is plug the camera in and download the Nest App which will help you get started. This home security camera system offers 24/7 live video streaming. Thanks to this feature, you can always see what is going on in your home by using your smartphone. The Nest Cam will also notify you if it detects any unusual sounds or movement. The alerts will be sent to your phone. Not only does this camera allow you to listen to what is going on inside your home, but you can also use it to talk with your pet, for instance. If you notice that your pet is doing something it shouldn’t, you can use this camera to tell it to stop. In addition, this camera comes with night vision. This feature allows you to monitor an entire room at night but with a limited spotlight view. But, no matter how amazing all these features sound, it is important to know that this is the least an indoor security camera can do. Other competitors have come a long way over time and they offer cameras with all these features but for a much cheaper price. Nest is known for making a top of the line smart home products and so, if you are considering buying a smart camera for the area outside of your home, this one certainly deserves to be on your shortlist. The Nest Cam Outdoor Security Camera might not be as advanced as some other outdoor cameras. But, even though it lacks some advanced functions such as the sirens or the spotlight (which the Ring security camera has), it still has plenty other features to offer. First things first, the quality of footage during both nighttime and daytime is exceptional. The camera comes with an alert system which can detect people. In addition, just like the indoor Nest Cam, this security camera provides two-way engagement feature that allows you to talk to visitors or ward off any unwanted guests if necessary. You can use this feature even if you’re not at home simply by using the accompanying app. In addition, you can use Amazon Alexa to control this Nest home security camera. But, you should keep in mind that even though this camera does offer some wireless features, it is not truly wireless like the Arlo security camera. Unfortunately, this camera has a few shortcomings as well. One of its greatest disadvantages is that you have to make sure that you install this camera properly since there is no ability to control its position by using a remote. 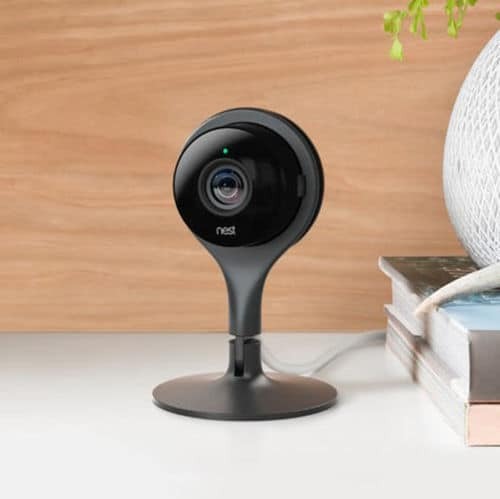 In addition, the capturing of this camera is limited to three hours unless you are willing to spend some additional money on the Nest Aware monthly subscription. 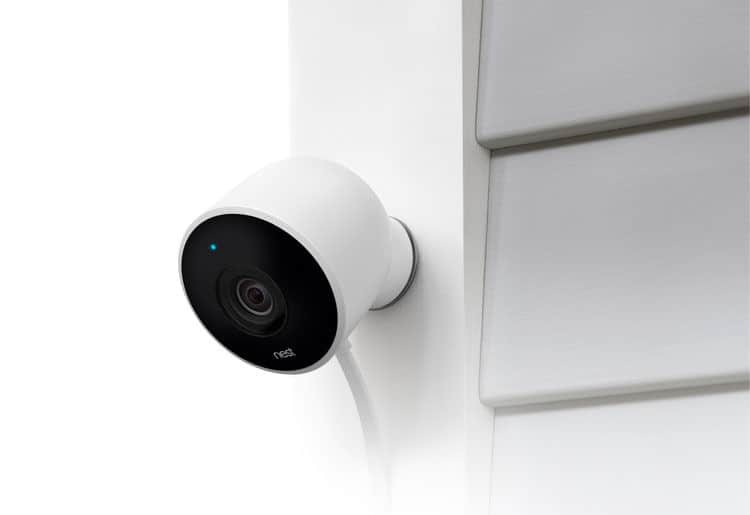 And, when it comes to spending additional money, you should keep in mind that adding multiple Nest outdoor cameras can be more expensive compared to other brands such as Zmodo. Kuna Maximus Smart Home Security camera works both during the day and at night. This advanced surveillance system can detect movement at your door as well as send alerts to your Android or iOS device, allowing you to take action if necessary. You can use the lights, 2-way intercom, HD live video feed, 100+ decibel siren, and even prerecorded deterrent messages. The Kuna Maximus Smart Home Security System allows you to control multiple HD outdoor smart lights and home security cameras from your smartphone. 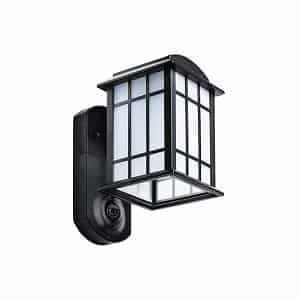 This outdoor camera will make you feel at peace regardless of where you are because it will always be there, protecting your home and family. Kuna home security system has got you covered, and it will help you keep an eye on your backyard, front door or your home’s side entrance. Thanks to the live HD video feed, cloud recordings, and advanced activity alerts, Maximus Smart Security System will enable you to watch over the things that matter to you the most, night and day. Kuna security camera starts recording ten seconds before an event is triggered. This feature ensures that you have an overview of the entire event. There is no limit on the number of the HD events captured. Other than that, there is a free two-hour look back feature. In addition, you can download all events that last up to two hours. The best thing about this is that this feature can be used for free. The Amcrest IP2M-841 ProHD WiFi IP Security Camera will help you stay in touch all the time with the things you love, anywhere, anytime. After you complete the quick and easy mobile setup process, you can expect to get secure access to the video stream of your camera in no time at all. You can playback recorded videos or stream live video of your home, kids, and your pets on the go made possible with the accompanying Amcrest View app. The Amcrest Cloud provides optional cloud recording with the free live viewing as well as four hours of free storage for videos. The cloud can be accessed from all devices including Windows PC, Apple Mac, iPad, iPhone and all Android devices. The Amcrest cameras can also record footage to an internal microSD card, upload to FTP, and save footage to the Amcrest Network Video Recorder. 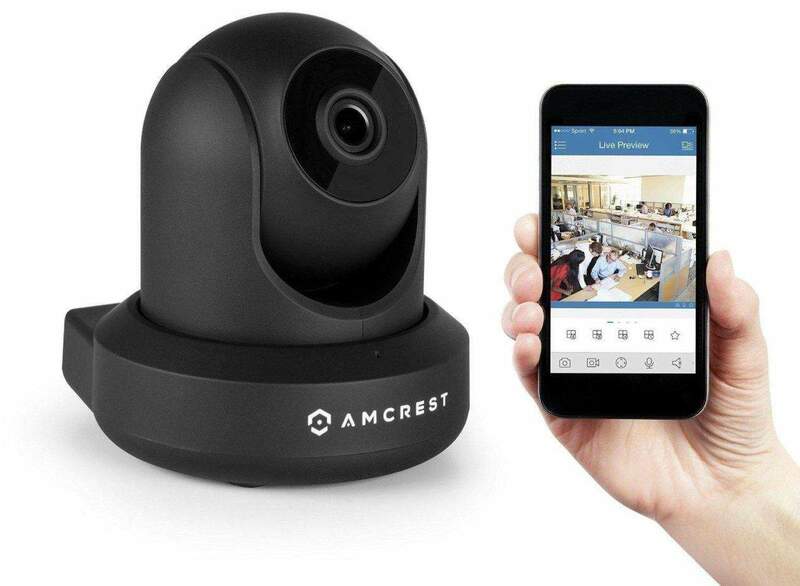 Every Amcrest camera comes with certain features such as the night vision, two-way talk, remote tilt/pan, improved digital zoom, and smart motion alerts. The cameras also have 90-degree viewing angle, will email you snapshots and alerts, and allow you to use advanced options for recording. They also come with wireless AES WPA2 encryption and secure SSL/HTTPs connection. If you have the Amcrest ProHD installed in your home, you will never be out of loop ever again. The Amcrest cameras are also compatible with the Foscam cameras when you use AmcrestCloud, Blue Iris for Windows PC, or Amcrest NVRs. These cameras can also be used with the TinyCam Monitor for Android and Live Cams Pro for iOS. Thanks to all these features, you know that this surveillance system will never let you down. The XMartO Wireless Camera is another incredible camera system. Users say this system is one of the best wireless security camera around and that it holds the very quality it claims to hold in its online description and from the user reviews. The camera is incredible, from the way the system is designed all the way to the design of the phone app. This camera also has a free app that comes with it, so you can bring your video footage with you when you are out and about and still stay in the loop and keep an eye on things at your home or business. The only complaint regarding this product is that video quality is sometimes not as consistent as one would hope it would be. The video footage can sporadically cut in and out, leaving you with some blank footage on the security tape. However, it is not a common problem and it has definitely not stopped users from raving about the system and continuing to purchase it for safety use. One of the finest parts of this system is that it has a great reputation when it comes to night footage. The quality is almost as if you were watching a video that was recorded in daylight. Don’t let the earlier complaint we mentioned about sporadic video footage keep you from trying out this system. It is truly a quality system that comes at a reasonable and fair price. It includes everything a great home security system should have: a free app so you can take your system with you remotely, excellent night vision capabilities, wonderful daytime vision qualities, and an easy setup and installation experience that will leave you happy and satisfied. 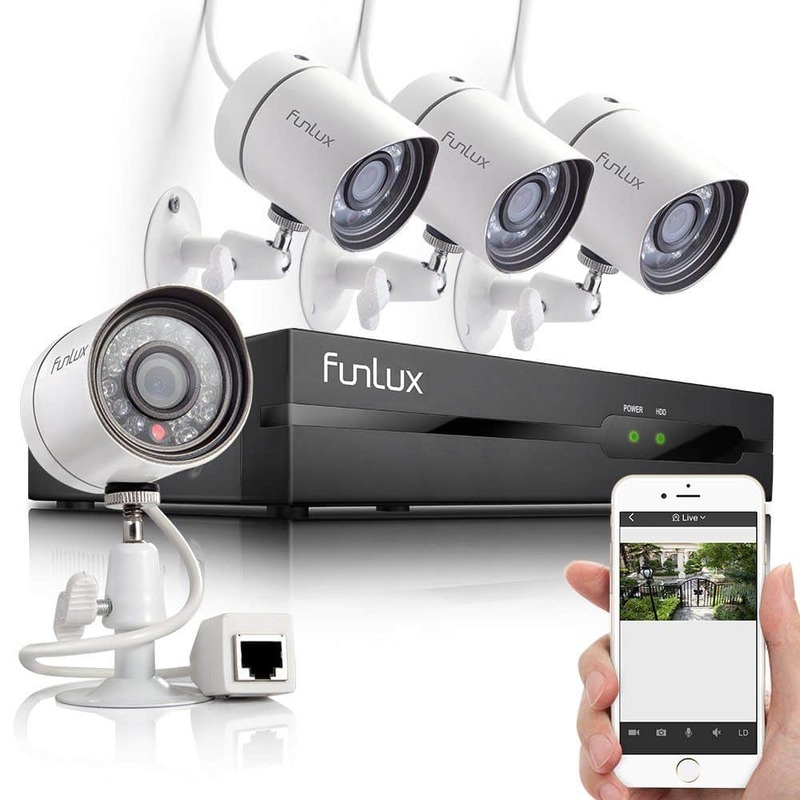 Funlux 4 Outdoor Security Camera is an all-in-1 four channel NVR kit that allows you to set up four outdoor 720p cameras and connect them in several minutes. In addition, you do not have to know much about the network or computers in order to be able to do this. Thanks to the simple design of the Funlux 4 Outdoor 720 HD Security Camera, the setup is made incredibly easy. No extra adapters or cables are required for included IP cameras. All you have to do is plug a cable of one of the cameras, scan the provided QR code, and you’ll get the preview of the videos or live stream on your Android or iOS device. Its NVR is compatible with multiple PC systems including Windows Vista, 8, 7, and XP. It can also be used on smartphones Android and iOS smartphones. The Remote Access feature can be used on a PC, tablet or smartphone. The Funlux 4 Outdoor camera is completely weatherproof and includes night vision, infrared LEDs, and a lens. Since it is weatherproof, you can use it outside of your property to monitor everything and see who is outside your gate or door. Funlux 4 security camera also comes with 1-year warranty and 60 days money back guarantee. You will also get a lifetime technical support you can use whenever you have concerns about using your camera or if any inconvenience comes up. 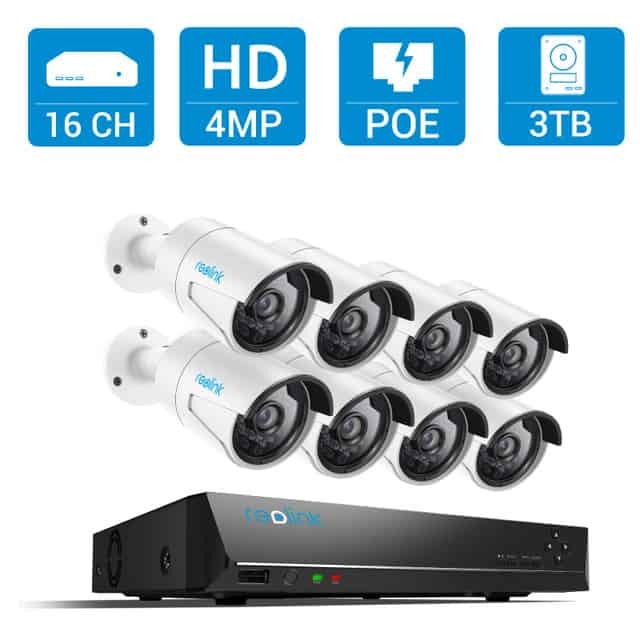 This home security package includes four bullet IP network cameras, two camera cables, a mouse, a CAT5e network cable, and an NVR. An accompanying app is also available for free and it allows you to access the videos through your mobile device or a computer. Due to the important role that surveillance systems play in our everyday lives, surveillance companies managed to come up with so many different features for their home security systems. However, with so many choices available, picking the perfect one for your home might be very hard. Good home surveillance cameras offer high resolution, as well as outdoor and indoor recording capabilities. Thanks to the advancements in technology, you can expect more flexibility and better performance. Resolution – Surveillance cameras have different resolutions and, the rule of thumb is the more you pay the better the resolution will be. When it comes to resolution, it is important to decide whether recording in color only is the only important factor to you or you want night vision compatibility as well. Majority of the models in this guide have a decent resolution quality. However, you can always invest in sharper images or cameras with better range for improved outdoor monitoring. Wireless Capability – A lot of surveillance systems are wireless compatible. You can use the wireless connection for streaming live video directly on to your mobile device or computer. Some tech providers offer apps while some will require you to use your browser whenever you want to see real-time footage. Many outdoor models don’t have any wireless capability, meaning that you will have to hook the cables to your monitor or DVR for you to review the video feed. Audio – Majority of home models have built-in microphones. This is ideal for listening in on your little ones or keeping an ear on your pets. Many security cameras for home come with two-way audio capacities, allowing you to talk to the people or even your pet that is being recorded by the camera. Most of the outdoor models don’t have the capability of audio surveillance. Outdoor/Indoor Capability – Before choosing the best surveillance system for your home, you have to decide where you will set up the cameras. In case you want to use them exclusively as a baby monitor or to keep an eye on your pet while you are out, you might want to go for an in-home model. Such models typically aren’t as durable as the outdoor ones and they don’t come with any weather protection. The outdoor surveillance cameras are designed to be able to handle extreme temperatures as well as snow and rain. Design – When it comes to the design of security cameras for home, there is almost an endless number of different choices. However, the most common models are round, dome-shaped or bullet-shaped. Many of them come with attachment cables and mounting stands, although these are not included in all packaging bundles. You will have to look into this before you make a purchase since you may want to pick up extra components that will make the camera compatible with the rest of the surveillance system. These are the most important things that you should look into when choosing the best home security system. Thanks to the constant advancements in technology, prices of older models are constantly decreasing, making surveillance systems now a common household option. This was not the case a decade ago. Back then, all home security systems were considered high-tech luxuries and could be found only inside the mansions of millionaires. Home security systems will not only record any unwanted people snooping around your home, but they will also discourage potential criminals from attempting burglary at all. If you install a surveillance system with visible outdoor cameras, the burglars are very likely to go and search for another victim. Some homeowners use dummy cameras for this purpose. However, real cameras are much better than non-functioning cameras since they will provide you with all the information that you might need. On top of that, they will allow you keep a close tab on your family and property. People are afraid of being robbed, and for many, being robbed while you are away is less scary than having someone break in while you are at home. Every now and then, we all wake up in the middle of the night startled by a sudden noise. Going back to sleep without ensuring yourself that no one really entered your house can be quite difficult. With the help of a home surveillance system, you can say goodbye to all these worries. By installing a home security camera system, you can have a look at the back door, front door and any potential entry points from the comfort of your bedroom. This way, you can be ensured that your family is safe and sound. There are some parents who hire nannies but still want to be able to keep an eye on their children. Nanny cameras are the perfect answer to anxious parents. These cameras can be installed in your kid’s room and monitor your little one’s activities from your phone, laptop or tablet even when you are miles away. These cameras can detect if a nanny is abusing the children or leaving them unattended. These cameras can also help detect any possible emergencies at home so you can act accordingly. More often than not, people get robbed, and the burglars don’t leave any trace behind. With the use of remote home surveillance system, you’ll have evidence that can be used before the courts. Besides all this, sometimes it is quite useful to have a security system and check out who walked through your gate and who is standing in front of your door. Do You Need More Than 1 Camera? Choosing single or multiple cameras depends on the layout and size of your property. If you need to know what is happening on the outside or in more than one room, you will need to install more than one camera. Generally, a lot of homes and small businesses can be monitored easily using only four cameras. You should ensure that every camera focuses on the primary areas of space you are monitoring including the doorways and entrances or other openings such as roofs, windows, and any space from which intruders can gain access. You can always increase the number of cameras according to your needs. Will You Be Using the Cameras Outdoors or Indoors? Some surveillance cameras are designed either for either outdoor or indoor use. The indoor cameras are lighter, smaller, and less visible compared to outdoor cameras. On the other hand, outdoor cameras are more expensive compared to indoor models because they are designed to withstand not only weather elements, but also the attacks from thieves, vandals, intruders, and any other unwanted guest. A lot of high-quality security cameras are made for both outdoor and indoor use. For additional protection, some outdoor surveillance cameras may be disguised and made less noticeable. While the majority of office and business spaces are well lit during the nighttime, homes aren’t. If a certain area is dimly lit, it is more likely to become a target of an intruder. If you would like to protect an area that has poor lighting, you will need to get infrared home security camera system. Cameras that have IR features are also known as night vision cameras, and they can record even in complete darkness. Some cameras might not be infrared, but they still might be able to function in areas with dim lighting. What Level of Recording Resolution Do You Need? This is a frequently asked question when it comes to surveillance systems. Around 550p is good for indoor systems to monitor a single area. If you would like to use a surveillance system that can record long distance, it would be a good idea to choose one that has cameras with 720p and that provide satisfactory image quality. How Wide or Far Angle the Security Cameras May Cover? The answer to this basically depends on the size of the camera lens. Therefore, before you purchase a home security camera, you must check out the size of the lens and the focal length it can cover. Bigger image sensors enable more light to enter into the picture and will give you wider and better view. Do I Require Weatherproof Cameras? If you would like to use a surveillance system outdoor, it is a wise idea to go with the cameras that can withstand any weather elements. Owning such a camera will make you feel calm and safe because you will know that bad weather won’t affect the performance of your home security system. To provide additional protection, you can always place your cameras in areas that are dry and covered. There are a few other things you should keep in mind when trying to find the perfect surveillance system that will suit all your needs. You have to keep in mind that every system has its unique way of allowing clients to view the videos. For all other details, you should consult the manual or the website of the manufacturer. Majority of DVRs allow remote viewing. In addition, you can watch recorded videos and live events from any computer. You may also use compatible apps that will allow you to experience hassle-free viewing on your PC, tablet or smartphone. To be able to do this, all you need is an internet connection. The brand or company of a surveillance system is also important. It is advised to buy from the company that is known for its reputation. The company should also have a good customer support so you could get quick answer or solution if any issues arise. While purchasing any type of surveillance system, you should ask yourself some questions that will help you find what’s really best for you. If you are not sure with what you really need, it is a good idea to ask a professional or an expert to explain all the features of several surveillance systems to you so you could decide if any of them meets your requirements. Using and purchasing a surveillance system requires thorough research, careful thinking, and some planning in advance. You should know exactly what you need your home security system to do and make sure to be aware of its capabilities as well as limitations. When shopping around, make sure to consider both the positive and negative reviews of a particular surveillance system. Every product has its flaws and you should decide which flaws won’t affect you too much. If you already have a home security system, make sure to compare it with the one you would like to get to see if it’s worth upgrading or not.